I'd like you to meet Lil' Sparky, a white male pup with brown and black spots who, at six months old, is one of the younger members of the Bangkok street dog community. This adorable little bundle of love is quite a shy fella, and he usually adopts the submissive posture you see in this picture whenever someone tries to photograph him. It's as if he's saying "Oh my, what a great big scary world out there, and I'm so small and everyone and everything else is so big, and there's all these scary sounds and interesting smells, and... hey, is that a camera, oh no I'm scared!" 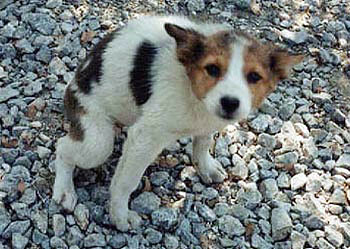 Like many Bangkok street dogs, Lil' Sparky entered this world in a baptism of fire brought on by staggering misfortune. Born under a highway overpass, Lil’ Sparky was the smallest and weakest pup in his litter (I don’t like the word ‘runt’). Not long after he was born, Sparky and the rest of his litter were forced to fend for themselves after their mother was captured by dog catchers during a citywide stray dog crackdown prior to an important international conference, and sent away to a far-off province. Then, to make matters worse, Sparky’s brothers and sisters abandoned him about 2 months later, claiming that he was too slow and weak. 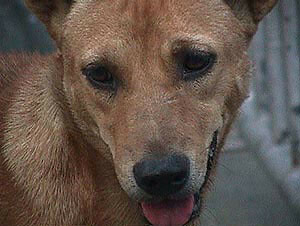 Sparky wandered the streets of Bangkok for weeks afterwards, foraging for food and looking for friends. Although life had, to that point in time, dealt him nothing but a series of soul-crushing disappointments, Lil’ Sparky never gave up hope, certain that around the next corner would be the friends and sense of belonging to a group that he’d always craved. Sure enough, when he came trotting through a small market where me and some friends were hanging out one evening, we immediately sensed his positive energy and kind spirit, and welcomed him into our community. That's not to say that Lil' Sparky isn't picking up some bad habits along the way. As he matures, Sparky is increasingly expressing a desire to use rude language, chase female dogs, and howl for no apparent reason late at night. He calls it "running with the big dogs." We call it 'annoying', and are in the process of teaching the cheeky little fella some much needed canine manners! That's just way too cute. Sparky is just so adorable!! Okay, I'll say it, since nobody else will. Sparky's taking a crap in this picture. I bet he got more than a little upset at you, Cass, for catching him in such a compromising position! I am loving this baby! Too cute!